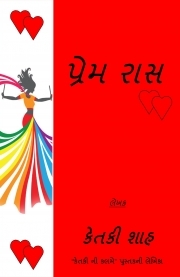 Description of "Prem Raas (eBook)"
This is Gujarati edition of book which refers to the audience who believes in love and philosophy of love. The author narrates herewith her feelings towards love; her beliefs towards love and her love towards love. Love birds will find this book tempting and will also help them out in understanding the essence of love. Mesmerize your soul with love, by love and for love. Author Ketki Shah challenges you about you felling in love after reading this book. Whether you believe or not in love; she will make you feel believe in it with due respect the way you believe about your existence on this universe. Living beings are found universal and so do love. Love is universal. Read the book for knowing more about love. Mrs. Ketki Shah is a full-time household wife who pursued her career as a self published author and thereby narrating her thoughts about love. Have a glance on the subject of love; which itself adds temptation for reading this book. This is the second book published by her. Her first book was "Ketki ni kalame" which enlightens on the subject of living in the custom made society. She likes to be critical on the subject of her writing; showcases her point of view to the readers and gives freedom to the readers to think independently on that subject matter. Reviews of "Prem Raas (eBook)"